Scientists have already built basic quantum computers that can perform certain calculations; but a practical quantum computer is still years away. In this article, you’ll learn what a quantum computer is and just what it’ll be used for in the next era of computing. Today’s computers, like a Turing machine, work by manipulating bits that exist in one of two states: a 0 or a 1. Quantum computers aren’t limited to two states; they encode information as quantum bits, or qubits, which can exist in superposition. Qubits represent atoms, ions, photons or electrons and their respective control devices that are working together to act as computer memory and a processor. Because a quantum computer can contain these multiple states simultaneously, it has the potential to be millions of times more powerful than today’s most powerful supercomputers. This superposition of qubits is what gives quantum computers their inherent parallelism. According to physicist David Deutsch, this parallelism allows a quantum computer to work on a million computations at once, while your desktop PC works on one. A 30-qubit quantum computer would equal the processing power of a conventional computer that could run at 10 teraflops (trillions of floating-point operations per second). Today’s typical desktop computers run at speeds measured in gigaflops (billions of floating-point operations per second). Quantum computers also utilize another aspect of quantum mechanics known as entanglement. One problem with the idea of quantum computers is that if you try to look at the subatomic particles, you could bump them, and thereby change their value. If you look at a qubit in superposition to determine its value, the qubit will assume the value of either 0 or 1, but not both (effectively turning your spiffy quantum computer into a mundane digital computer). To make a practical quantum computer, scientists have to devise ways of making measurements indirectly to preserve the system’s integrity. Entanglement provides a potential answer. 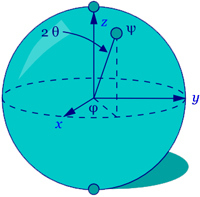 In quantum physics, if you apply an outside force to two atoms, it can cause them to become entangled, and the second atom can take on the properties of the first atom. So if left alone, an atom will spin in all directions. The instant it is disturbed it chooses one spin, or one value; and at the same time, the second entangled atom will choose an opposite spin, or value. This allows scientists to know the value of the qubits without actually looking at them.